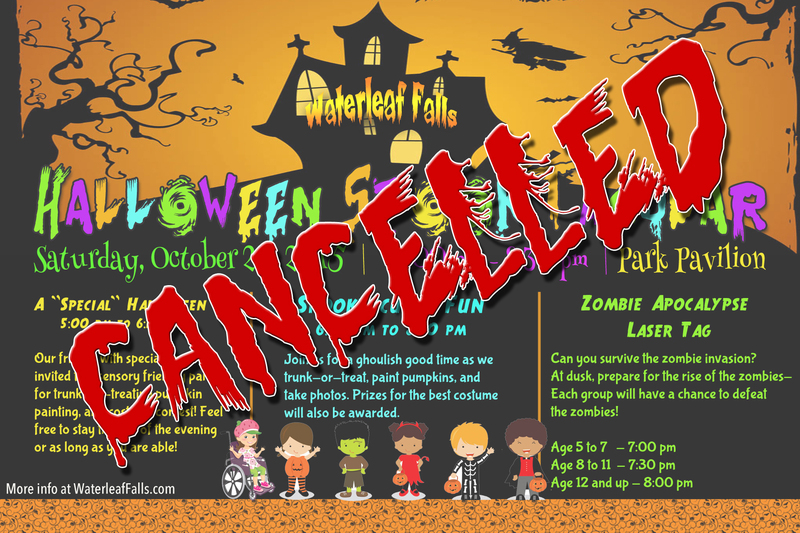 Unfortunately, due to the impending weather, Social Committee has decided to cancel the Halloween Spooktacular. We are reviewing other options and hope to have the event at a later date. If we are unable to reschedule, we hope to make our Christmas event that much better. We hope all of our neighbors stay safe this weekend! With the expected excessive rainfall, winds, and potential flooding caused by Hurricane Patricia, we regret to inform you that your Social Committee has had to cancel this event. Everyone keep dry and stay tuned for our next event. 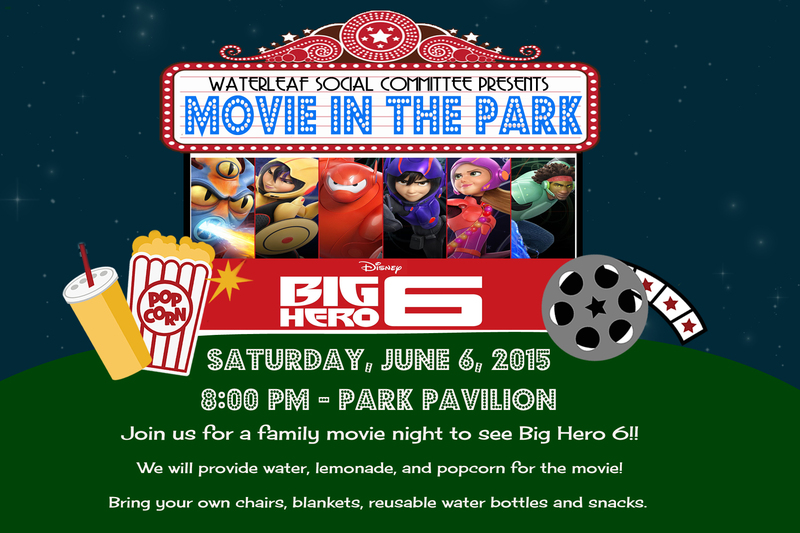 We will be throwing a Beast of a party for all the Waterleaf Monsters and Princesses! From 5:00 to 6:15 will be dedicated to our neighbors with special needs. Children will be able to trunk-or-treat, paint pumpkins, and we will have a costume contest with awesome sensory bags prizes! Please feel free to stay as long as you’d like and stick around for zombie laser tag if you are able! Then from 6:30pm to 8:30pm All other Waterleaf Goblins can enjoy the fun! WATCH OUT!!! At dusk (around 7pm), the Zombies will rise! Join us for Zombie Apocalypse Laser tag! Each age group will have a chance to defeat the Zombies! We will be finalizing the plans for our Halloween Spooktacular event, discussing things that need to be done and tying up any loose ends. We will also be brainstorming on any fundraisers/drives we can do for the upcoming Holidays. If you have ANY IDEAS please come to the meeting and share them with us, or email them to us as well (if you can’t make it). 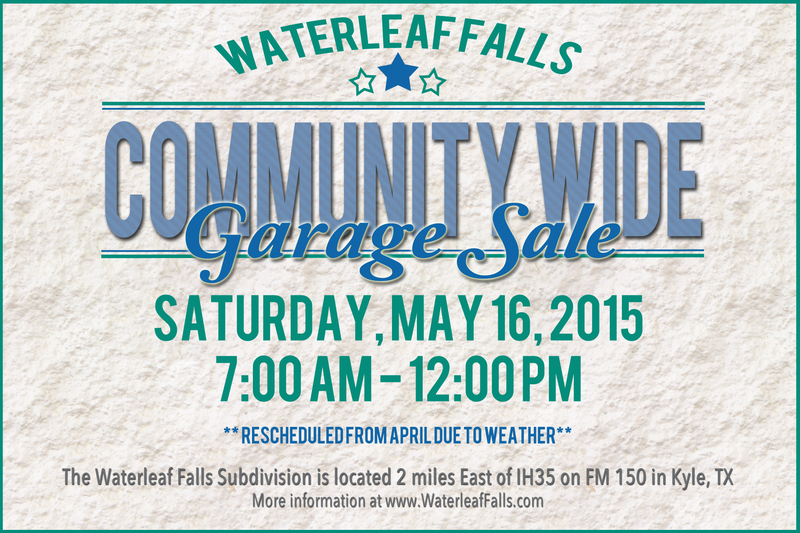 Contact us at waterleafsocial@gmail.com if you are interested in helping or have ideas. 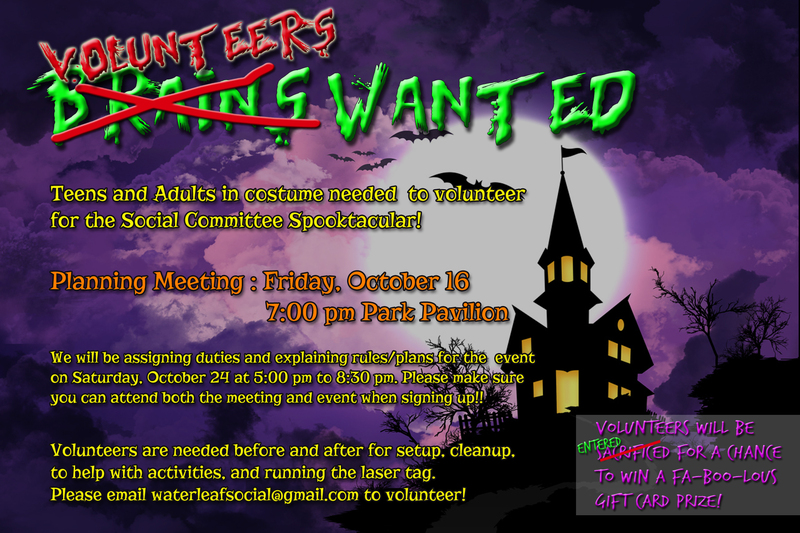 We are in need of volunteers to help run our Halloween event. We are looking for teens and adults who can attend the event IN COSTUME to help things run smoothly. If you are able to volunteer please attend our planning meeting so we can finalize everything for the event. 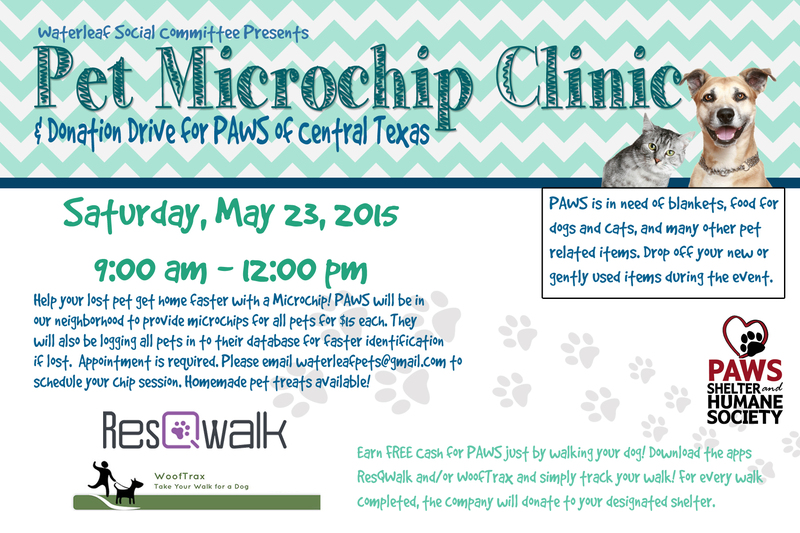 Volunteers will be entered for a chance to win a gift card!! Depending on the number of volunteers, there may be more than one prize up for grabs! 7:00 am – Until you sell out! Clean out your closets and storage rooms, Here comes your chance to make room for new toys and clothes with another Community Wide Garage Sale!!! Set up in your own yard or driveway and get ready for the buyers! We will advertise the event on various garage sale sites, so there is sure to be plenty of foot traffic. We will be brainstorming on what and how to come up with something ghoulish and fun for our little monsters and princesses to do for Halloween, so bring your mad scientist ideas with you and lets have a frightful good time planning it. The more that people participate the more fun things we can do, also the more volunteers we have the better experience you will have! Let’s make Waterleaf Falls the envy of Kyle! We would love more volunteers in the neighborhood. We have over 900 homes and only the same few people attending meetings and planning events on a regular basis. Fresh faces bring fresh ideas and new ways to bring the community together! 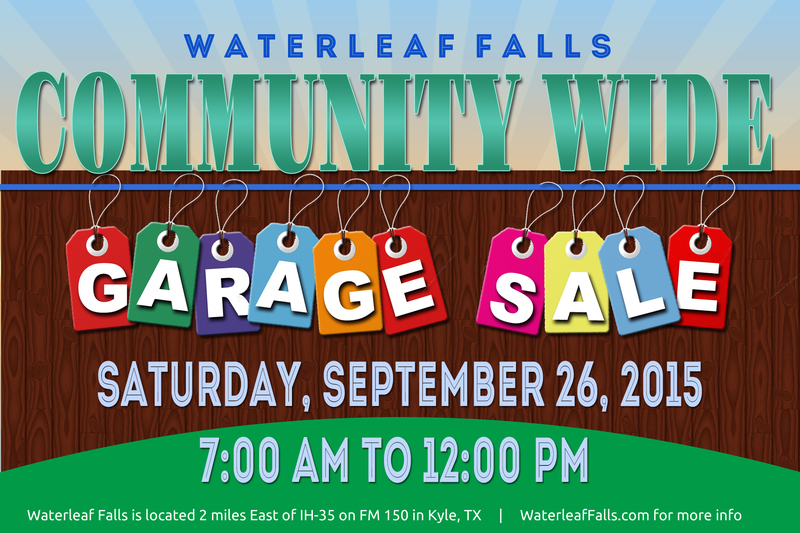 Don’t forget the Community Garage Sale is coming up on September 26th!